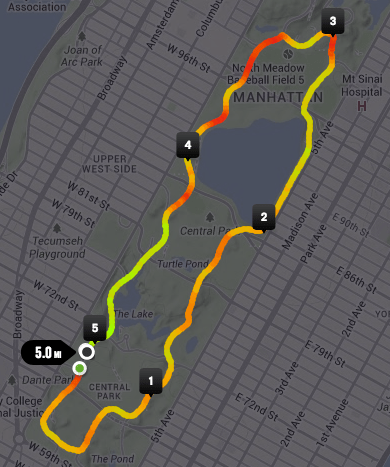 When the race started, we headed south at W 67th street, into a huge mass of runners. This was unusual for most New York Road Runner races in Central Park, but as we moved, the reason was evident. The handicapped racers had been given a slightly earlier start time, and they were all over the road, causing running to slow down to go around them. As runners passed each of the Achilles runners, we cheered for them and for their attempt to run the five mile course with us. The crowds spread as we reached W 61st and curved east. The heat was obvious from the very beginning, but NYRR accommodated by having water stations near each of the mile markers. Our shirts were drenched in sweat as we ran up East Park Drive from E 61st street all the way up to 102nd street before heading west and back down West Park Drive to the finish at W 69th street. Unfortunately, I was forced to walk a little bit on the hills in the last mile, but was able to finish strong in 48:35. It was inspiring to see all the handicapped runners out on the course while running the five miles, and going back to cheer them on with my DetermiNation teammates after passing the finish line. Watching them run in wheelchairs and crutches, blind runners, and runners with prosthetics fills the heart with hope, knowing that they are strong enough to put themselves out there and push themselves to complete the same five miles as we did.